Phantom III is the same specification as the Phantom II, but has an updated armwand, new internal wiring for armwand and bearing housing. The Phantom III surpasses even the highly rated Phantom II and when compared to other tonearms on the market, tests and preliminary user comments have confirmed that the Phantom III is in another, altogether higher league of performance. Compared to the original Phantom, as well as the Series II, the III has a similar outward appearance, but has important internal differences. In addition to the refined Magneglide ™ stabiliser, new internal wiring for even better detail and improved freedom from any mechanical resistance, there is an upgraded pivot design for even greater dynamics, together with a new titanium arm-wand, the III has incorporates a new pivot housing assembly. This assembly, comprised of a constrained layer combination of brass and tungsten, provides greater energy control and damping, along with improved bearing performance. Incorporating a slightly reshaped counterweight to allow for great cartridge weight ranges and lower moment of inertia, the result is greater transparency, broader sound staging (both side to side and front to back), with greater bass impact and extension. Combined, these refinements yield greater performance in the areas of thundering dynamics and sheer musicality, while retaining a delicacy of detail, quality and convenient features the earlier Phantom was always noted for. A tonearm with Stable Balance can be identified by measuring the tracking force at the record surface level and again at a raised position above the record. If the tracking force INCREASES at the higher position, the arm has Stable Balance. Their own previous designs – the best they could make at that time – also had this limitation due to the use of side weights to provide lateral stability. Other uni-pivot arms with low-slung counterweights will all exhibit this force; the lower the weight, the more counter-force is applied. Although this technique is often promoted as a “high-stability” design, it does so at the expense of consistent tracking force and linear cartridge performance. . It actually results in varying tracking forces during play when traversing even small warps, accompanied by non-linear cartridge operation, and increased record wear. Once Neutral Balance is chosen for use in a uni-pivot tonearm, one must remember that both the vertical and lateral planes will be affected the same way; without proper lateral stability, such a design would not have consistent, proper vertical alignment, and the pivot would tend to flop over to one side or another (usually in the direction of the weighted cartridge offset angle mounting). Obviously this condition must be avoided. In combination with pivot fluid damping (similar to that used with the Model 2.2), the Magneglide (TM) system allows normal vertical pivoting of the tonearm in true Neutral Balance, with extremely low friction; yet, provides a strong lateral stability that feels almost like fixed bearing arms. (No wobbling of the arm as it is lifted, for instance). In addition, this dual-damped system forces the Phantom to pivot in the correct vertical plane of the stylus tip, with no rotation as the arm is raised. No regular uni-pivot can achieve this important geometric requirement. Even a few fixed bearing arms don’t get this right! If the vertical motion of the tonearm is in plane of the arm tube itself (and not the correct plane of the stylus face angle), the cartridge will tend to tip over to its side as the arm is raised, as when tracking over warps. This will cause noticeable channel imbalance and reduced tracking accuracy. The simplest method of installation, is simply to use the SME profile, and make sure the long slots point between (bisects) the TT spindle and outside edge of the platter. In addition to that, you want to be sure there is a good clearance underneath, say, at least 2-1/2 inches FROM the centre-line of where the arm mount is finally located, and that is at least the width of the SME slot (or bigger) We also find that having a maximum depth of about 1/2″ (maybe 3/4″) for the arm mount board is desirable, in order to give adequate VTA travel range for the cable parts underneath. The effective length of the arm is 235mm, so the distance from spindle to pivot should be 217mm for the standard arm, and add about 13mm for the “XL-10″ version of the armwand we offer. (This option is really only for large-diameter platters such as the Clearaudio with clamping ring, and is NOT, in my opinion, any better than the 9-inch length. I have strong convictions about the current propaganda for 12” arms, and it’s NOT for the longer length….. The exact angle at which the arm base is oriented is best measured by having the actual turntable and arm on hand. This is to be sure that there is proper clearance for the VTA tower and count weight when the arm is at the inner grooves. 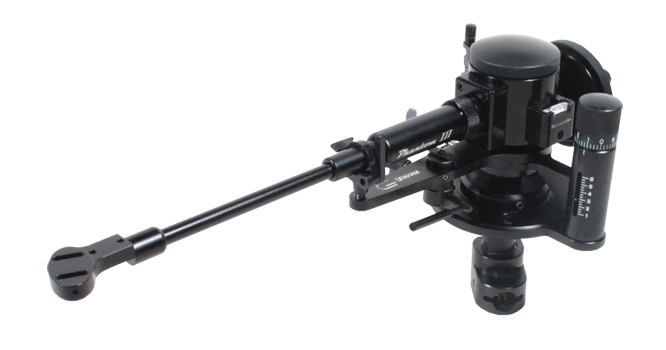 When we design a new arm board for anyone, it’s a two-step process; the first being to locate the main arm mount hole of about 50MM diameter at the right distance from the TT spindle, and the second step being to locate the four mounting holes according to the clearance demands of the VTA/c’wt tower described. It’s easy, really, but I’ve found that with the particular parts of the Phantom arm (and the 2.2 before it) it’s not quite as easy as with the more basic arms like Rega, etc. It’s that VTA tower issue mostly….